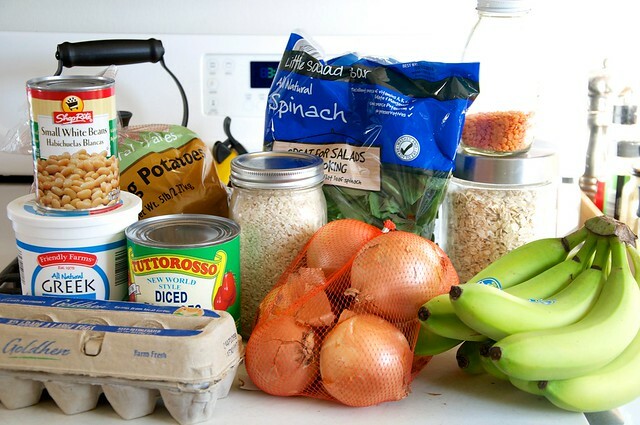 I recently shared with you guys my favorite, cheap winter grocery staples for this year. 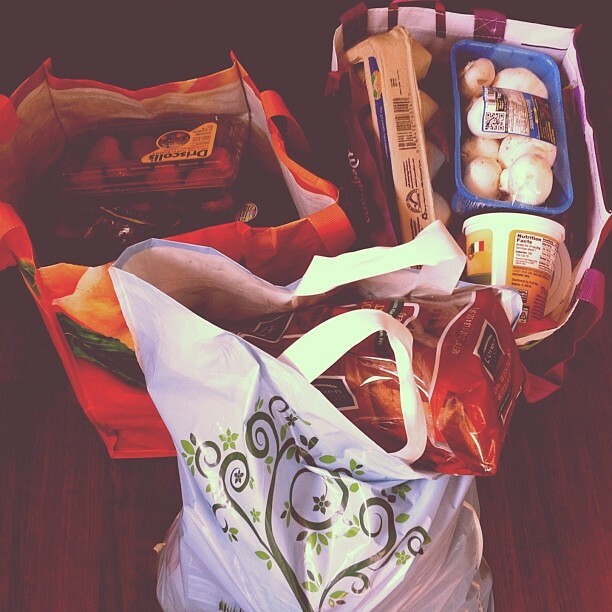 What I haven't talked about in quite a while is our actual food budget. Of course, there's good reason for it: We hadn't been able to stick to one until recently. When it was just the two of us, hitting around $50-$60 a week was so relatively easy. 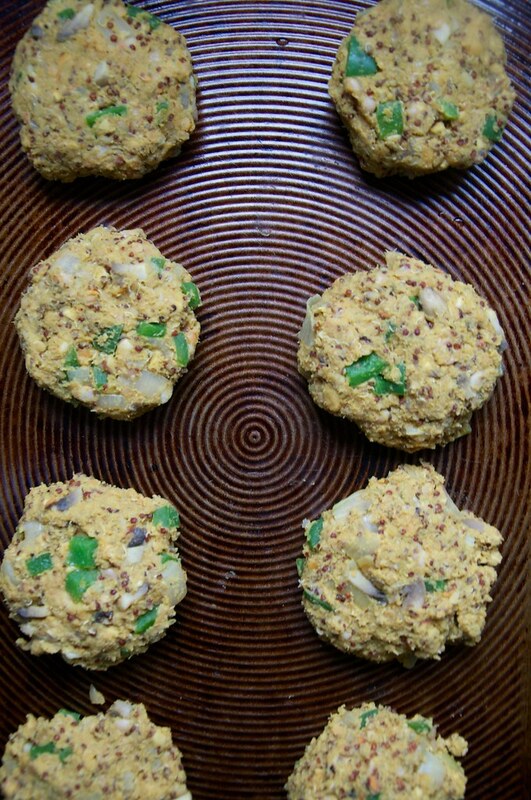 We cook most of our meals from scratch and we're vegetarian, but don't eat a lot of packaged extras. And then came Ada. She breastfed for over a year with bits of food mixed in here and there, and after those first 365 days -- her appetite increased (that tends to happen with kids -- they grow!). Obviously, adding another mouth to feed is going to cost some money, but with a picky palate, we fell into some bad habits with buying Ada separate foods to match her moods and relied on some convenience snacks to get by. Add to that the great cloth diaper disaster of 2013, and our weekly bills were creeping higher and higher. As much as I try to gloss over it, we also spent the bulk of the last year dealing with various medical procedures and (too much) stress to do detailed meal plans all the time. I'd say we were spending around $100 each week up to higher totals, depending. I had gotten into a great rhythm and loved doing our Vegetarian Freezer Month experiment in October, but then we fell into this funk. Now that things are looking up for us again, we're doing a reset on our financial handles. We're looking into buying a different house, we have tried living with one car and it's not working (so, we need car #2), we'd like to put Ada in a couple mornings of preschool in the fall, etc. Basically, we need to find room in the budget for all this stuff, along with savings and emergency funds. It's possible, but it'll take some finagling. Food is one of those variable costs that we can play around with, as most of our budget is fixed with the mortgage, both our student loans, car payments, utilities bills, and so on. Entertainment is also taking a cut, not that it was significant to begin with, but -- and as I've done in the past -- also a shift. I'll share more once we get it all ironed out. Not surprisingly, I was motivated to visit Aldi after the explosion of sponsored posts recently splashed across blogs and websites I frequent. We have three stores in the area, all around equal distance from our house, but the last time I had shopped there was over 5 years ago, and I wasn't too impressed. I had been toying with going again, but didn't feel too optimistic. The lines are long. You have to bag everything yourself. You have to pay cash or debit. Little selection. Yeah. Food, at least back then, was definitely hit or MISS. Etc. But I also wasn't looking at it in the same way. Thing is, I'm glad for the social media boom because the last three weeks, we've done the bulk of our shopping at Aldi, visiting Wegmans only to pick up the occasional block of tofu, a single tub of Earth Balance, or bag of whole wheat flour. And with our CSA kicking in during the spring -- I could see us shopping exclusively there. 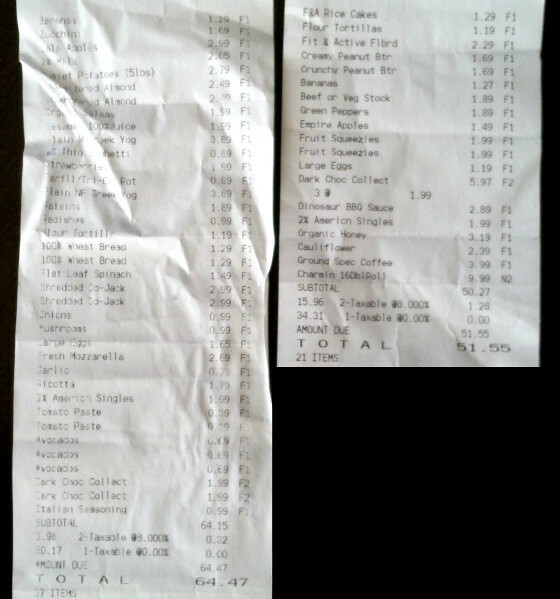 Basically, our groceries cost us $100 for the last two weeks (not including that $10 package of toilet paper, which goes in our household budget and I stocked up on chocolate to share with my mom)! I would have included our first receipt, but I can't find it -- that trip was also just over $50. Granted we have some staples in the house already (beans, oats, yeast, to name a few), but without temptation to get all sorts of other things, I am able to stay on task with my shopping and will likely not increase an insane amount to stock up on the staples. The prices and unit prices are clearly marked. They have most of the basics, and you guys know I enjoy making great meals with few, extremely un-exotic ingredients. I got a nice loaf of sliced bread for just over a dollar that doesn't have tons of added ingredients. The dairy is incredibly less expensive: 3 cups of cheese for the price that 2 is at our usual store. Greek yogurt that is a steal. Yet, they also have some amazing stuff like super dark chocolate that is to die for. I have absolutely no affiliation with Aldi and have had no contact with the store in any form. Still, I wanted to share my piece because I'm a real person who tries to eat well on a real (tight) budget and have been really impressed. Enough to finish off our month's shopping there this Saturday, when I'll likely need to stock up on some staples. I'll continue shopping there if the price at the checkout continues to be so good (and the food continues to be so fresh/tasty). For once, I like making a simple, no-real-brainpower-required shift that's enabled us to lean out the budget. 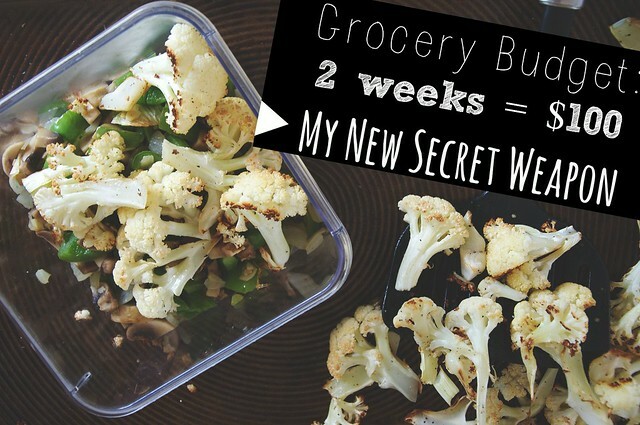 It meant simply switching stores and writing out our meal plans again and getting smarter about using my ingredients before they spoil (which I'll get to in another post -- soon). But as I've learned in the past, we'll still need to keep on our toes. *** Oh, and I also like that I HAVE to bring my own bags. I can't as conveniently forget them -- though we did have to buy a plastic one on our first trip. But I'm looking to upgrade since mine have a lot of holes and broken handles -- do you guys like classic canvas bags or these pretty mesh totes? They're around the same price, and I see the merits of each (like canvas being sturdy, but mesh being really portable). Do you shop at discount grocery stores? I know Trader Joe's is related to this store -- quite literally -- but we don't have those anywhere near here for me to compare. (Are the prices good? Is it considered a discount store like Aldi?) There are obviously some positives and negatives, which I could cover in another post. But when the bottom line is in the mix, I have to go with what makes cents for us.